BBC Scotland’s Disclosure Team find evidence of recent racist activity in Scotland! Reporting Scotland, Saturday 29th September at 5.30pm, on racism in Scotland was, well, more racism NOT in Scotland. 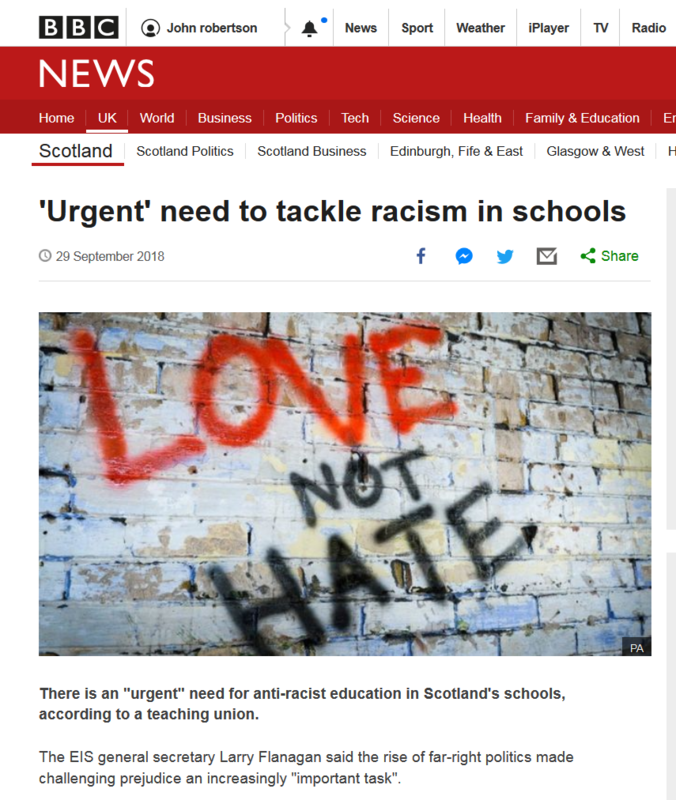 We heard about a worthy EIS initiative to reduce racism in Scottish schools, but Reporting Scotland clearly felt they should be able to justify the project with evidence of a need for it. They couldn’t find any Scottish examples, so we had mention of the Manchester Arena bomb attack and some anecdotal tales from Anas Sarwar. I heard he didn’t get the Labour leadership because he is….rich and his family firm don’t pay the living wage. We even heard of a rise in far-right politics. Do they mean in Scotland? Where? Who? Remember these figures include graffiti, passing comments and tweets on semitism (17), racism and attacks against English, East Europeans, sikhs, catholics and presumably protestants too. So, once again Scots, don’t get any ideas about being different. The only “racism” on view is the BBC’s perpetual Scotophobia. Harry Flannigan of the EIS was happy to help the broadcaster. As I recall stating racism isn’t a problem in schools but in wider society. But, John, everyone knows that Scots are dour and cranky while the people of England are gifted with a wry, pawky sense of humour. Whae telt yee that? Aaach, I’m scunnered noo! Maybe I heard it on the BBC or read it somewhere in the papers – so it must be true??? Hope ye’re feelin’ better noo. So the BBC wants to promote increasing racism in Scotland. To prove we’re not anti-English get out there and insult a foreigner. Despite your provision of statistical evidence that it is a minor (but unpleasant) problem, I am sure that there will be some ‘expert’ on race issues wheeled out to say, ‘Of course what we are seeing is just the TIP OF THE ICEBERG’ and so, QED, there is a problem of racism. Some months ago, Professor Tom Devine demonstrated that sectarianism (“Scotland’s secret (sic) shame”) was declining rapidly and was pretty much on the periphery He also showed why claims that it was mainly directed towards RCs were wrong. This rebuttal is from a man who is a practising RC and who was rebutting assertions being made by an RC organisation. However, his article produced letters of denial, without evidence other than a few isolated incidents or references back to say the notorious pitch invasion after the 1980 Scottish Cup Final between Celtic and Rangers. Continuing these old tropes is one of the ways that our lazy journalists avoid doing proper journalistic work. I need a drink after reading thst. Seriously, Tom Devine was very informative on that unlike James Macmillan, wealthy victim that he is. Your photograph at the top of KKK members, brought to mind the possibility that the ‘Klan’ part could be linked to Scotland and racism and the fact that it is spelled with a K indicates how Scottish education has gone to the dogs since THAT SNP GOVERNMENT was elected. The fact that the KKK was founded in the 1860s only shows how the malign effects of THAT SNP GOVERNMENT can actually reach back into history. Is there no end to their infamy? I just hope no one from the BBC has read your comment.. As for the K, clue and clucks have also been wrongly spelt, thoroughly upsetting members of the original ‘Find the Chicken Under the Kilt Game Appreciation Society’.